Take this Route 66 adventure: without the internet there would be no route66alfa blog. Without the internet it would have been unlikely that Fred was driving this specific Giulia, purchased in the Netherlands. Without the internet I would not be making this trip. Of course one doesn’t need the internet to travel Route 66, but if I was to do such a trip at all, it would not be with Fred and Beverley. Our friendship started in 2006. Fred had been reading this message on the Alfa Bulletin Board and decided to fly across the Atlantic, together with fellow American Todd. Cor, the third man from the 2011 Three men and a Giulia cross country trip, responded to Fred’s message and that’s how we met. Cor and I have been friends a couple of years longer. 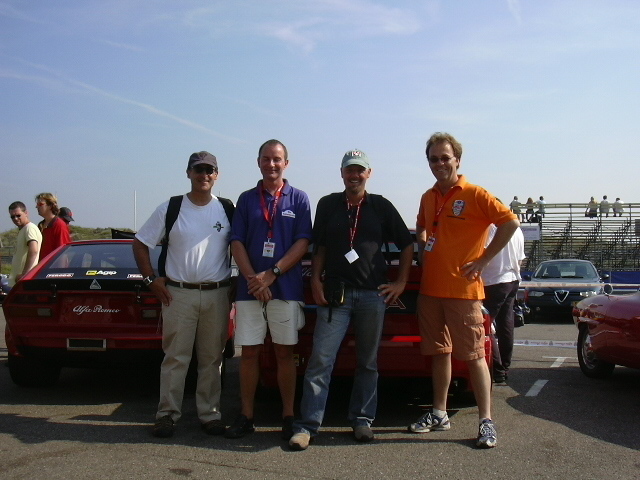 We live just a quarter of an hour walking from each other, but without the forum of the Dutch Alfa Romeo owners club SCARB we probably would not have known each other. Apart from friendships, thanks to the internet the whole world can be your neighbor. We just say hello, make a friendly remark (I deliberately forget about the loads of nonsense and rudeness all over the net) and have a peek at what someone far away is doing. May I suggest: Kåre from Norway, working on the restoration of his 1750 GT Veloce. Who knows, maybe sometime in future we will meet? Great article Dink. Thanks for the link to the old AlfaBB thread telling of when we first met. Nice memories with more to come I think. « New or old, still fun to drive!